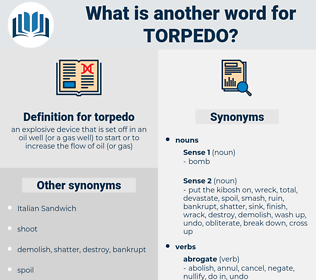 What is another word for torpedo? 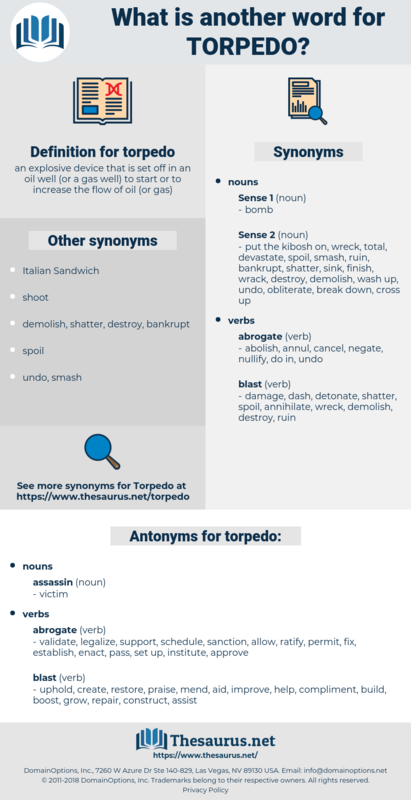 destroy, undermine, thwart, disrupt, jeopardize, spoil, demolish, damage. derail, scuttle, wreck, sabotage, frustrate. validate, legalize, support, schedule, sanction, allow, ratify, permit, fix, establish, enact, pass, set up, institute, approve. uphold, create, restore, praise, mend, aid, improve, help, compliment, build, boost, grow, repair, construct, assist. protect, win, succeed, do well. wait, strengthen, secret, connect, put together, obey, join, agree, keep quiet, lose, fasten, stay, combine, cause, stabilize, secure, hide, attach, unite. arrange, bear, give birth, keep, start, add, tip, begin, continue, imbalance. promote, clear, open, advance, release, liberate, give up, facilitate, float, push, free, abet, attract, encourage, inspirit, let go, forward, fail, increase, surrender, yield, save. withhold, hold, walk, conceal, backfire. He was blown to pieces when the torpedo struck. Could be anything from a torpedo on up." homing torpedo, bangalore torpedo, submarine torpedo, aerial torpedo. warning signal, pyrotechnic, alarm, explosive device, alarum, alert, armament, firework.